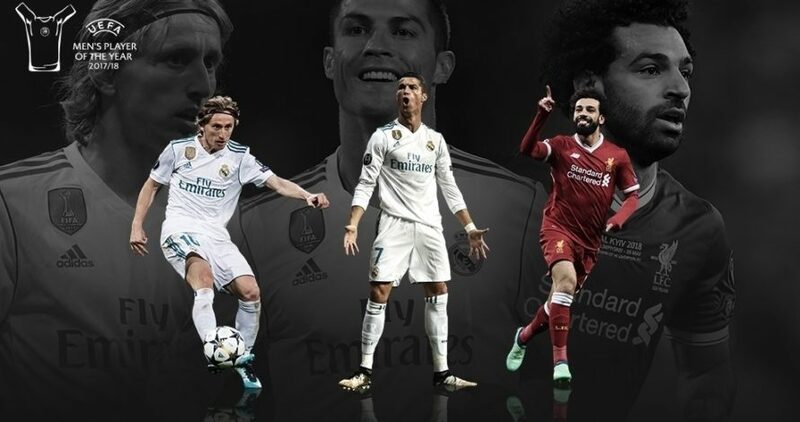 Luka Modrić, Cristiano Ronaldo and Mohamed Salah have been nominated for the 2017/18 UEFA Men’s Player of the Year award. The winner will be named – along with the UEFA Women’s Player of the Year and UEFA Champions League positional award winners – during the group stage draw in Monaco on Thursday 30 August. The UEFA Europa League Player of the Season will be announced the following day. A UEFA Champions League winner, a FIFA World Cup runner-up and recipient of the FIFA Golden Ball. A UEFA Champions League winner for a record fifth time and UEFA Champions League top scorer for the sixth campaign running. A UEFA Champions League runner-up and a multiple record breaker in his first term at Liverpool. What is the UEFA Men’s Player of the Year award? The award recognises the best players, irrespective of nationality, playing for a club within the territory of a UEFA member association during the past season. Players are judged on their performances in all competitions – domestic, continental and international. How were the players shortlisted? The shortlist of three players was selected by a jury comprising the 80 coaches of the clubs that participated in the group stages of the 2017/18 UEFA Champions League (32) and UEFA Europa League (48), along with 55 journalists selected by the European Sports Media (ESM) group, representing each of UEFA’s member associations. Jury members chose their top three players, with the first receiving five points, the second three and the third one. Coaches were not allowed to vote for players from their own team. Voting for the UEFA.com Goal of the Season is also under way, with the winner set to be announced on Monday 27 August.